We collect stories from someone’s life and turn them into a book of stories to be read aloud by friends and family. She asks caregivers to write on slips of papers those things that would be most helpful to them. It might be half a day taking over for them in their caregiving duties, or it might be doing some laundry, or going grocery shopping, bringing over a meal, cleaning the bathroom, etc. Just any job that caregivers do every day that someone could take over for them as a gift. 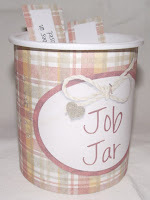 Putting the jobs on slips of paper in a jar gives friends and family a chance to decide which jobs they could reasonably help with. Instead of saying to a caregiver, "Is there anything I can do to help?" 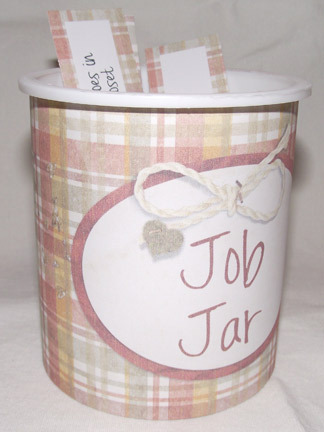 Using the Job Jar ensures that the caregiver gets the help that they really want and really need but may not ever ask for. Another really great idea is for the people who are living with Alzheimer’s and dementia. This is an experience that we create that can be used all throughout the year, but it is especially poignant during the holidays. Here is our idea: We collect stories from someone’s life and turn them into a book of stories to be read aloud by friends and family. We make sure that the print is large enough for older people to read and we also print the stories on card stock, as these pages are easier to turn. We place the stories in a three ring binder. The stories can be accompanied by photos or with a CD of holiday music. These stories can be very simple, perhaps just a snapshot of an event. We encourage you to do this to help the people you care for share the memories and the stories from their lives. One last easy and very enjoyable tip is to put together a recipe book of family holiday favorites. Again, these recipes are printed in very large font. Reading the recipes aloud to each other is a great way to rekindle memories. And, don’t forget to sing some of your favorite holiday songs together!